Today will be the first day of the rest of your life. During your time at Trinity, you will make lasting friendships and memories. And we hope this starts happening as soon as you arrive “home” on campus. You are ready to get started—so let’s get you moved in! 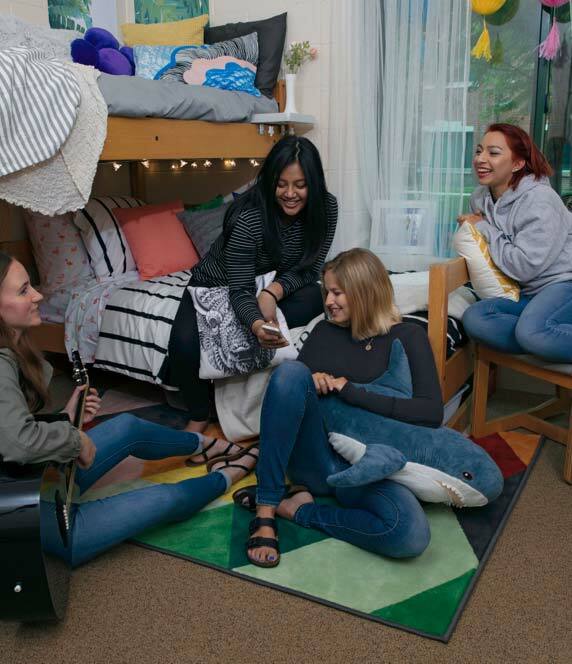 As a resident at Trinity, your space comes furnished with a twin-sized bed and mattress (36″ x 80″), a desk and chair, dresser, closet space and a bookcase. You have the opportunity to make your space your own. We provide ways for students to loft their beds and the furniture is stackable to make many different configurations. You will be able to customize the arrangement of your room in a way that works for you and your roommates. This list is a general overview of items that typically are used in the residents halls. We recommend that you consult with your roommate in order to determine who might bring certain items due to space and economic considerations. Note: All items on this list must, where appropriate, be Underwriters Laboratory (UL) rated. This is not an all-inclusive list; if you are unsure about an item, please contact the area directors. Remember to bring only what you need; many things can be shared with your roommate(s). A good rule of thumb is if you don’t use something when you are home, then most likely you won’t use it at college and it will just take up space. Bed sheets. Extra-long sheets are not necessary. 2 sets recommended. Laundry bag/basket, detergent, bleach, etc. Your room is not just your room, it’s your home away from home so it is time to make it more customized to your needs. Do I need extra long sheets? No. Mattresses are a little larger than standard size. However, most deep pocket sheet sets will work and accommodate a mattress pad, if you want one. Do I need a physical for college? You are not required to have a physical conducted. However, all students are required to have an immunization record on file with the student life office. What if I want to live at home with my parents? We encourage you to live at Trinity and carefully consider the value of a residential experience – we firmly believe that it will dramatically enhance your overall experience at Trinity. If you and your family decide that it would be best for you to live at home, you will need to complete a housing waiver form. When will I need to get and use my I.D.? You must have your I.D. picture taken in the student life office; for new students, will have an opportunity to have your picture taken at BluePrints registration. Your I.D. serves as your meal card, your access card for the residence halls, and your library card. You will need your I.D. immediately upon your arrival as a student. However, you will not be able to pick up your student I.D. until you have submitted the appropriate forms. You will be able find these forms on your student portal under “My Student Life”. We request that you complete these prior to your arrival to campus. The student portal is an individual student account that provides up- to-date information regarding transcripts, student life, billing, financial aid, etc. Your student portal can be accessed via the Trollweb and will require your log in information. Contact your admission representative with questions regarding your computer log in information. How do I get my authorization code for Resicom-TCC's phone system? For all new resident students an information packet with details about the phone system, how to access rates, and registration for an authorization code will be distributed during the summer prior to your move in. When will I know my housing? New student housing assignment information is distributed at the summer BluePrints weekend. For students unable to attend BluePrints, housing information can be found on your student portal. Do I need to register my car for parking? Yes, you will need to register your vehicle online and then allow two days for your registration to be processed; the registration fee will be charged to your account. Resident students will receive their parking sticker in their campus mailbox, commuter students will be able to pick up your sticker in the student life office.Visit the Campus Safety page for parking details and regulations. Housing assignments are available for viewing on your student portal – log in to your portal on Trollweb and find the My Housing tab on the left. Additional details about your housing assignment and living on campus will be distributed at Blueprints. Assignment information will also be posted on your student portal.